Kirknewton now has a website at www.kirknewton.org. You can find out about the history of the village you live in under ‘About Us’. There is also details about how to get here, transport advice, things to do plus job/volunteer opportunities and links to your MP, MSP, Council, environmental advice and police service. There is all the latest news and a forum that gives you the opportunity to comment on anything about Kirknewton as well as a section to buy, sell and swap goods locally. There is a What’s On section with a listing of all the forthcoming eventsin the village and a Local Business Directory. There is a section on all the local Community Groups and web space for more information from them. There is a gallery for your pictures and you can also make an ‘eco-pledge’ for all to see. 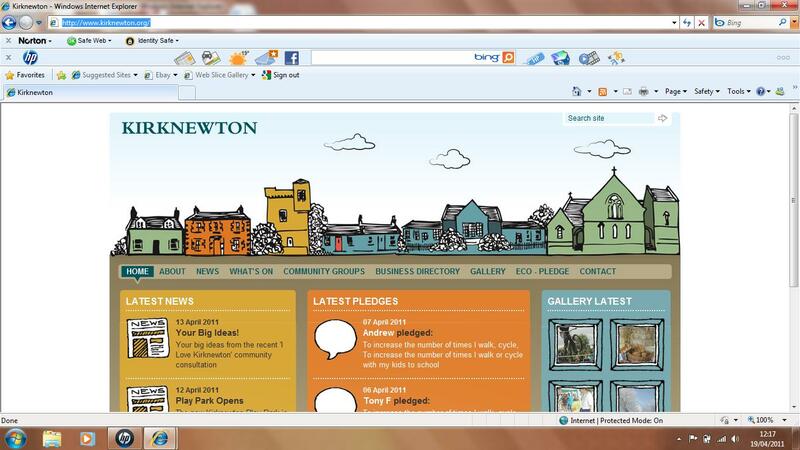 The web site has been produced by tictoc and the Kirknewton Community Development Trust. We hope you like it! If you have any news, jobs, volunteer opportunities, a business you want to promote, local community group information you would like to add or an event listings please send them to infokirknewton@gmail.com. That’s the same e mail for any corrections to the web site or if you spot any glitches! Kirknewton doesn’t just have a website! We are ‘virtually’ everywhere! Your village can also be found on facebook, twitter and on a wordpress blog. Links to those sites are available at the foot of the new Kirknewton.org homepage.